Modart Book 01 is a ‘best of Modart magazine’, and gives an overview of what we printed and thought about during those years. Looking back it almost feels like we were watching the end of something special. To consider, the ‘end of what’, maybe you have to flip through the book and find you own story in there. Whatever else you might see inside, you will find page after page of exciting art from some real living masters. Hard Cover / Same format as the magazine… 256 pages of work and observations from artists like Will Barras, Kill Pixie, Mark Jenkins, Banksy, Mr. Jago, Tim Biskup, Ed Templeton, Space Invader, San, Doze Green, Adam Neate and many many more. 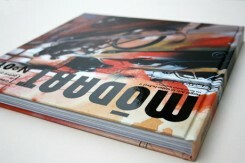 The book reviews all the sections, covers and action around every issue of Modart magazine. We already uploaded some pages to our FlickR account to give a closer impression of the book. Always feel free to contact us with questions about the book.